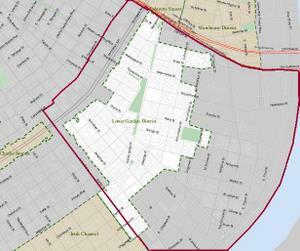 The white area of the map shows current boundaries of the Historic District Landmarks Commission in the Lower Garden District. The red line roughly traces the boundaries being propsed for it. City oversight of how buildings are designed and maintained could tighten throughout the Lower Garden District and into Central City and Mid-City, based on a proposal working its way through the city council. Based on a motion by City Councilwoman Stacy Head, the city will create new committees to study the possibility of expanding the reach of the Historic District Landmarks Commission from its current territory in the Lower Garden District, roughly between Prytania and Annunciation streets, to the entire swath from the river to Carondelet between Jackson Avenue and the Ponchartrain Expressway. The committees will also consider designating new areas in Central City and Mid-City for the HDLC to cover. The precise duties of the HDLC would be determined separately according to the wishes of each area, Head said. It could be limited only to preventing “demolition by neglect” and setting size limits and other standards for new buildings, or it could be given the power to oversee repairs to any buildings in its coverage area. Only one audience member spoke on the motion, Jennifer Farwell of the Mid-City Neighborhood Organization, who said her neighborhood is seeing an influx of new arrival who have good intentions but “don’t know how to effectively take care of a historic property.” Her group is already striving to encourage neighbors to embrace HDLC jurisdiction, she said. “We feel very strongly that MC needs this protection,” Farwell said. Before the motion passed unanimously, Council President Jackie Clarkson added her support for it. Mayor Mitch Landrieu will appoint the study-committee members, Head said. This is a monumentally stupid idea. The HDLC already has very little enforcement power, and forcing the redevelopment of depressed areas of Central City to go through HDLC review will do nothing more than slow things down for those who actually try to comply. Some buildings may not be salvaged because of the expense. Keep in mind that the HDLC insists that original materials be used in repairs to buildings in historic districts regardless of expense at the staff level. They’re willing to tell applicants to spend $6,000 for something that should cost $1,000 even if it makes no aesthetic difference whatsoever. Now imagine applying this kind of rule to a blighted building in Central City and every aspect of its renovation. A building that could be brought back into commerce for $100,000 now might cost more than a half a million. Who’s going to do that? Preservationists above all should oppose this. It guarantees more demolitions. If these areas want to be added it is because Councilmember Head’s constituents asked her for these protections. Don’t fret Owen…its not your neighborhood. And I could pick Councilmember Head over you any day of the week.